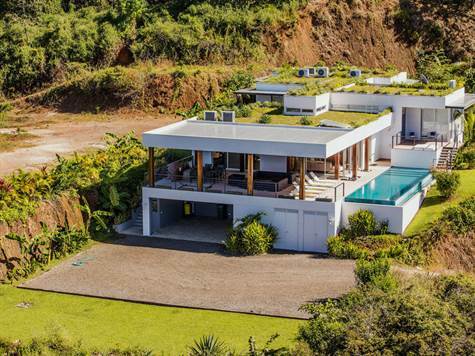 The Luna is a luxury villa which integrates some of the most ingenious architectural methods ever devised to complement the naturally sloped terrain on which it rests. The result is a magnificent and spacious residence that fosters a rejuvenation of mind, body and soul amid the tranquility of a breathtaking and exotic location. The Lunas blend of exquisitely crafted lines and attention to detail is immediately apparent in the elegantly appointed rooms and expansive outdoor entertainment areas. The Kalia living team has spared no expense to enrich the Luna with the highest quality furnishings, electronics and amenities available. Perfect for retirement, vacation and everyday living the main features of the Luna are: A two story layout, open-style architecture featuring glass, native hardwoods, recessed lighting, ceiling fans and cool flooring, a spectacular infinity pool, hot tub and outdoor shower , outdoor kitchen BBQ, dining and entertainment area, European telescoping sliding doors that bestow a seamless crossover between indoor and outdoor living and a green landscaped roof system by Carlyle that provides superior insulation to keep the house cool. The Luna sits high atop of the Guanacaste mountain ridges and commands a spectacular view of the Pacific ocean and its ethereal sunsets. With spacious interiors, elevated ceilngs and large windows the Luna is one of those rare Costa Rican Jewels that has made the accentuation of natural light an art form, and from the moment you enter this magnificent residence you will be immediately enchanted.